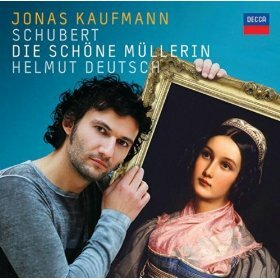 I mentioned that both Jonas Kaufmann and Matthias Goerne had recently produced recordings of Schubert's Die Schöne Müllerin. Sarah piped right up and said that Goerne's was better. So what could I do? I bought both of them and put them on my iPod. The result is certainly curious. If I select one of these albums, I get all the tracks from both, alternating Kaufmann and Goerne. This is certainly a good way of deciding whether or not Kaufmann is a baritone. After he does a track, you hear an actual baritone doing the same thing. I suspect Sarah prefers Goerne because he is a baritone. Goerne has developed a style for Lieder that is quite attractive. He emphasizes his gorgeous legato and expresses the text primarily through darkening his tone to a deep, cave-like sound. 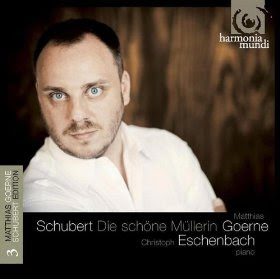 I feel his style is more suitable for Schumann. Kaufmann is lighter and piu leggiero. For me this is more suitable for this the most gemütlich of Schubert's song cycles. I see Wunderlich has also recorded this with a far more tenor-like sound, but I refuse to buy it.